The 2 Florida grown have been in the ground for about 5 months and the California grown for about a month. Now, the FL grown ones did experience a week of nights ranging from 26-33f. So far the CA grown one has experienced 2 nights at freezing and a handful of mid 30s. What I find interesting is the two FL grown ones both have damage but one significantly more than the other. Genetics? Only about 6 feet apart. CA one looks perfect so far nearest to the pool. Disclaimer: I already know this experiment has controls and variables that are not equal lol. I’m just a bored guy with too much time with a shovel and backyard. You'll probably need shade cloth for them when you start warming up. Interested to see how they do! I bought one a few years back from HD/Lowe’s and initially it will take some time adjusting because it’s probably shade grown to get that beautiful green foilage. But it’s been totally fine in the shade, just slower than slow. That'll be an interesting experiment! I have 5 Majesties in the ground, 3 small ones in shade in the back and 2 in 50% direct sun in the front. All were exposed to about 4-5 hours of 33-34F temps and had about 1/3 the damage in the above picture. 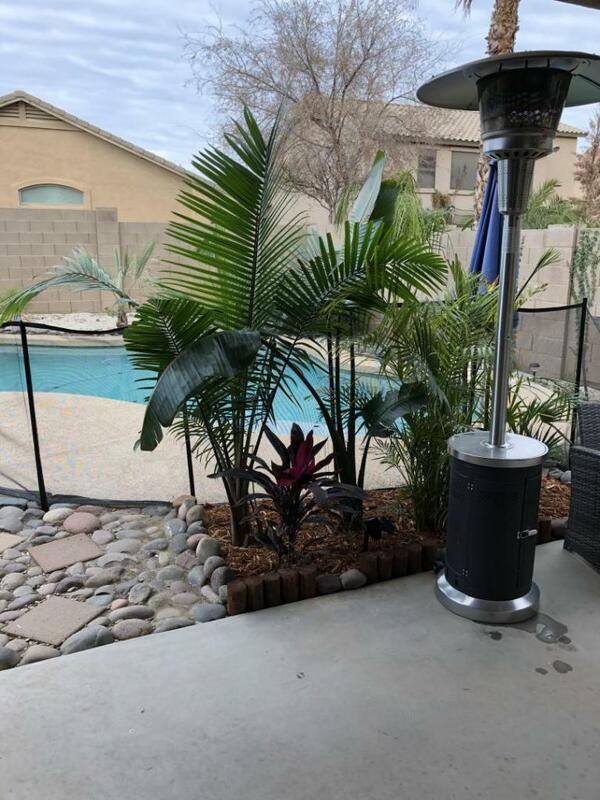 They were all a bit yellowed in the fall due to a lack of fertilizer (nitrogen symptoms) but the newer fronds were still fairly solid green and took almost no damage. I did have some problems with sun damage when I took down a 70' water oak in July, without some shade I bet those will be really unhappy for a while! Are you located here in AZ Merlyn? Biggest one from CA will get about 4 hours morning sun in summer and winter. North facing planting. Other ones are blocked by a south facing wall. If and when they grow to the same size they’ll probably be zapped. Or hopefully acclimated by that point if I keep them. Nope, I'm just NW of Orlando, FL. 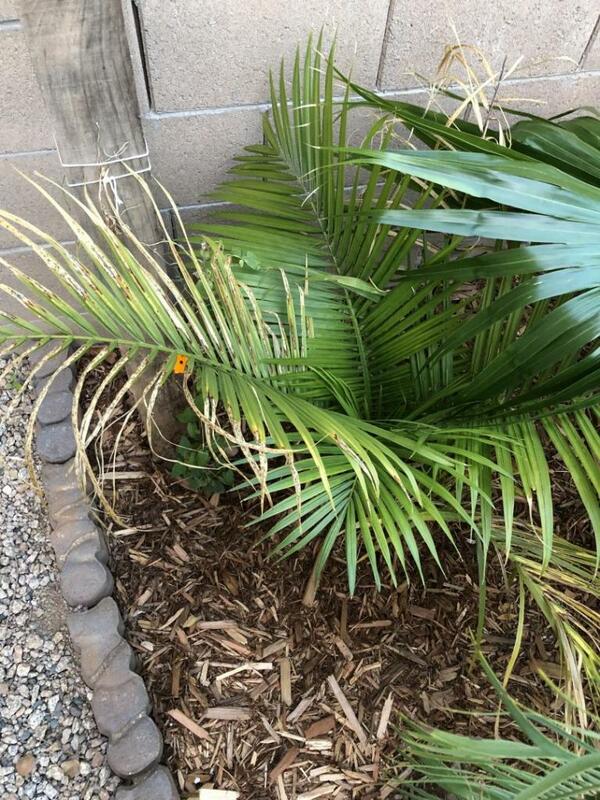 I just thought the comparative damage on similar-sized palms might be of some use to you! I see! I saw water oak and thought, here in AZ?? Just for some more info on the CA palm you bought. It came from these guys in San Marcos, CA. They supply all the Lowes/HD locations in North County San Diego. Very interesting! I see they appear to be grown outdoors under shade cloth which is great to know! 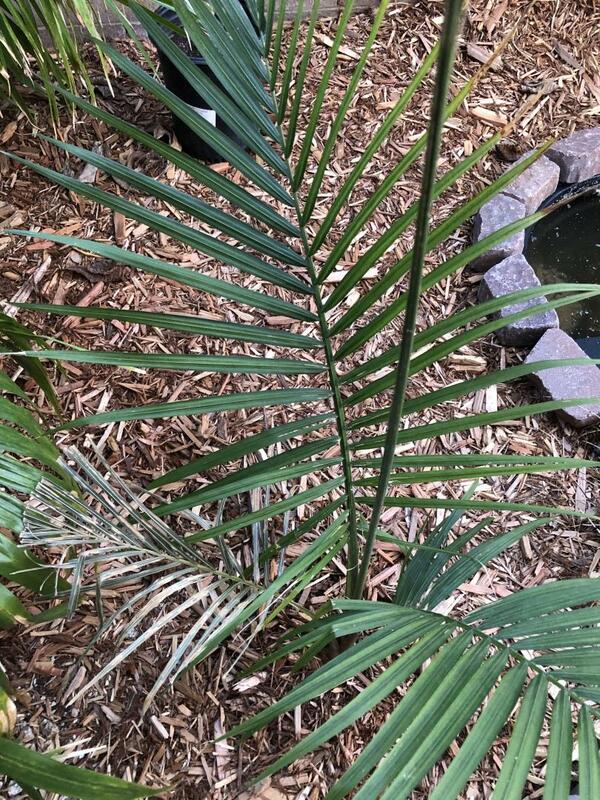 I know it’s far far from a rare palm but finding one grown in the west to me seems very rare. I’d never seen it. I had figured the lack of humidity was to blame. I think if they don't get too much hot dessert sun they will look good. During the summer they will want lots of water with all that dry heat. I'm pretty far inland here and I spotted one with over 20 feet of trunk not far from my place. If you plant something overhead to filter that intense sun out there would probably be the best bet. Not a rare palm but personally when grown well they look great. I want it to succeed just to see if I can do it. Luckily the largest and newest planted one will receive only morning sun (north facing) about 4 hours in the summer and is blocked by my home from eastern and southern exposure. So that should help with plenty of fert and water. The two others, one will get nailed with southwestern sun in the afternoon and the one further against the wall will be spared until it gets height if it can make it. I’m not stressing survival odds like my other palms so it’s fun to see how they do.